In the Antarctic, an American research team faces an extraterrestrial being that mimics the appearance of living things. 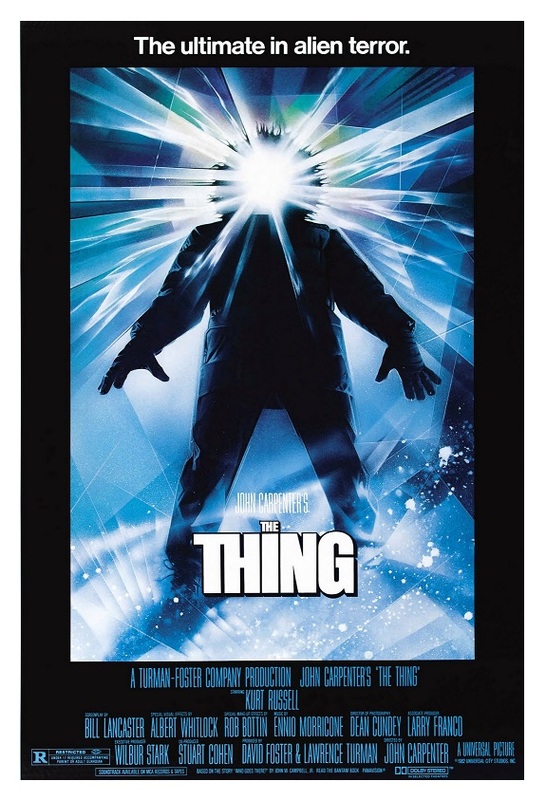 In my opinion, director John Carpenter (Halloween) successfully remade The Thing from another World. Carpenter’s revamping of the old classic failed to attract a large audience when it first debuted in movie theaters back in 1982, but the film’s fan base has grown over the years. If you liked the original and have never seen the remake, home video gives you an opportunity to compare both movies. It is hard for me to put one above the other — both films are equally effective in different ways. If the original reflects post-war technological anxiety, the angst of Carpenter’s bleak remake is more in tune with post-Watergate malaise. Essentially, this is a 1970s film made in the 1980s, and that might explain the movie’s poor performance at the box-office — Carpenter’s jaded world had no place in Reagan’s suburban utopia. The Thing is a really depressing, mean-spirited movie with mostly unlikable characters. On top of everything, the special effects are nasty, gory, icky. Anyone looking for a good, happy time in front of the TV needs to look elsewhere. I think the big difference between the two films is the level of exposition. Like Steven Spielberg’s Jaws (1975), the original builds tension by carefully choosing when and how to show the monster. The remake maximizes every opportunity to shock the audience. How you react to Carpenter’s modus operandi would most likely depend on your level of tolerance for the grotesque. My wife found the film tasteless and thought the original was an all together better constructed movie. I don’t necessarily agree with her, but I can see where she’s coming from. Bill Lancaster’s (Burt’s son) script doesn’t actually improve upon the original. Characters needed a bit more “soul” and the dialogue is pretty ordinary. Carpenter’s The Thing remains a primarily visual movie. The director has a keen understanding of visual vocabulary thus making his film cinematically superior in almost every aspect. His set-pieces are impressive, truly frightening (first time I watched the blood-test sequence I nearly hit the ceiling!). I find practical effects and stop-motion animation more aesthetically appealing than anything created by a computer, so I loved Rob Bottin’s (Star Wars) creatures. Albert Whitlock’s (The Andromeda Strain) matte paintings are fantastic too. In addition to Bottin’s nifty effects, Dean Cundey’s (Jurassic Park) cinematography helps sell the concept — it’s very atmospheric. Ennio Morricone’s (Once Upon a Time in the West) music score is simple, but eerily effective. Kurt Russell (Escape from New York) received top billing, but this an example of great ensemble acting — all actors (Donald Moffat, Logan’s Run, Richard Masur, Risky Business, Wilford Brimley, Cocoon, Peter Maloney, K-PAX, T. K. Carter, Southern Comfort, Keith David, They Live, etc.) are equally good. The Thing is still a scary and very entertaining horror movie. I guess because I’m a ’70s and ’80s kid, I can relate a bit better to the newer version, but I recommend both movies. Followed by a pre-sequel in 2011. Color, 109 minutes, Rated R.
I saw it 3 times now and I still love it. Nice review. Alien and The Thing were two movies from my childhood that scared the hell outta me.! Alien and The Thing — great idea for a double-feature!